This week has been fairly slow largely because we are cleaning up after last weeks VIRUS enclosure installation and because we have had many large rain storms. In the Mirror Strip and Wash room we are making some modification to make it more user friendly and preparing for commissioning of the acid stripping process once the contractors have the acid vapor duct in place and the fan working. This should be ready to start sometime in the next two weeks. Veliz Construction finished the Liquid Nitrogen slab backfill and sleeving for water line that must run under this slab. ARC also started the installation of the K-Hut exhaust fan. Weathers Electric continues running conduit between the pipe vault and the indoor breaker panel to support power lines to the dry cooler, Advantage Chiller and convenience outlet. ARC Mechanical working with the Mitsubishi rep, tested out the HVAC system and it is now fully functional. This means we now have new air conditioning capability in the lower electrical room where all of the new tracker electronics are located as well as more powerful cooling capability in the spectrograph room. This will allow us to put the High Resolution Spectrograph in a cold bath which will help us keep a more constant temperature and improve velocity stability. Air conditioning has also been restored to the HET offices and the clean room. Next week we will repeat of the 97-pt laster tracker test measuring only the hexapod control point, and a repeat of the 21-pt grid, measuring the control point as well as tip-tilt of the hexapod. This will provide an independent verification of the mount model imposed several weeks ago by the software and telescope controls group. This entry was posted in WFU on September 26, 2014 by shetrone. The big news this week is the installation of the first Virus Enclosure Unit. 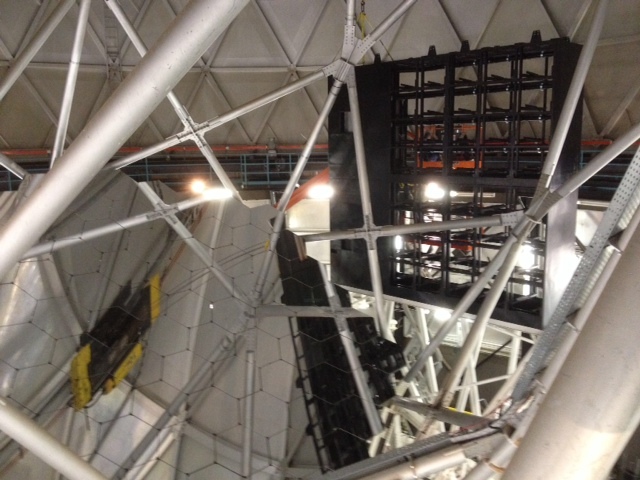 This large black structure came out on two 45 foot trucks and took two days to lift into place on the side of the telescope using the dome crane. It is roughly two stories tall and 5 feet wide. A very impressive structure that really changes the character of the telescope. In the coming week we will be adding the electrical components and a few more plumbing components. The second Enclosure will be delivered at the end of Oct.
A picture of the 1st side VIRUS Spectrograph Enclosure being installed on the HET. In the picture the team is busy installing the last section, the Top Annex. The software group came out to the HET last week and were able to close the loop between the DMI, tip/tilt camera and the TCS. Unfortunately, problems with weather kept them from making a progress with the CAT on sky. This week has not been any better. The telescope has only been open for very brief periods for the last two weeks; not even enough to complete an alignment of the primary mirror. Getting on-sky will be a priority for the coming weeks, although the CAT will likely be moved from its present location to the center of the rho stage so that we can do more extensive guiding tests on the sky. The Mechanical and Electrical contractors have made good progress of the last two weeks. The air-conditioning units for the upper electrical room and the spectrograph room have been removed and replaced with new units that make use of the large units out at the remote thermal area. This work has not been completed and these areas are currently without cooling for the next week until that work is completed. The work on the vault to the remote thermal area has essentially been completed including putting the steel plates over much of the vault and pouring a new water drain over these plates. The pylons for the Krabbenhut heat removal have been finished and they are currently working on getting the acid vapor brackets in place. The dirt work contractors have completed covering up the lines out to the remote thermal area and have started digging down to move the water line that is below the future location for the liquid nitrogen concrete pad. This entry was posted in VIRUS, WFU on September 19, 2014 by shetrone.